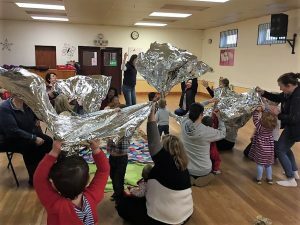 Music groups, singing and fun for babies, toddlers and pre-school children with their parents and carers in South West Wales! Hello, I’m Sue and I’m over the moon to be leading the Musical Bumps classes in South West Wales! I’m a primary school teacher with a real passion for music! I play the flute, guitar, piano and absolutely love singing. Having taught music to primary aged children, I have not only experienced the joy and fun that music brings, but also how music can develop and enhance social, language and mathematical skills. Starting out my own Musical Bumps business seemed such a natural next step for me to take. It’s real music, real education real fun but it’s also a real privilege to be part of the early musical journey of young children. We’ve asked for feedback for our new classes! This is what one mum told us…..
“We really enjoyed ourselves. The lullaby was beautiful and twinkle twinkle is an all time favourite..Leon sings it perfectly and knows all the words. Row row row the boat was fab too and we loved the percussion! Two other mums were saying how nice it was to hear new songs and I enjoyed hearing them too. You can phone us on 07472 365857 or complete this form to book your free trial class. Please complete the Spring term booking form. You can do this via our online form, or you can download the pdf version here. Please do not just turn up as we cannot guarantee there will be a space for you. We are unable to accept any bookings until you have registered with us. This is completely free of charge and is simply a one-off registration form which tells us how we may contact you, and how we may use your information. If you have already completed this, there is no need to complete it again. Free trial classes do not require prior registration. Musical Bumps South West Wales can create a bespoke programme of learning for your school or nursery’s specific needs. From one-off workshops or parties, clubs and choirs right through to a full music curriculum for EYFS and KS1. You can rely on Musical Bumps to provide stimulating, ambitious, practical and musical classes and clubs!